Hoodies Amsterdam Locals . Hoodies are known for their sporty and casual look but are also wonderfully warm, comfortable and fashion. 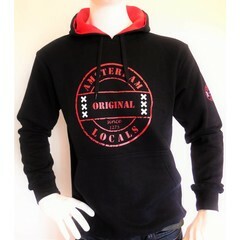 Our Amsterdam Locals fleece hoodies are strong, durable and made from waste PET bottles. Fleece sweaters and hoodies do not shrink, do not fade and are lightweight and therefore comfortable to wear, and really warm. We recommend our AMS. hoody because of the zipper you can fit it on like a jacket instead of like a sweater over your head.